I Usually don’t mind being in the know when it comes to trends, but lately I’ve been repulsed by some of the clothes/furniture/aestetics that seem to be everywhere (social media and real life), so I came here to think out loud, naturally. You can now buy a Gucci bag and slippers at Zara, Mango & co (guilty), and that coffee table that every blogger owns is probably on sale for 30e at two different furniture stores (also guilty). People are walking around quoting and tattooing words that were said in movies they never watched and songs they’ve never listened to. Mass production feat. Internet have, in a way, made it easier for us to “get” everything we want. Exclusivity has never be as available to us, mere mortals, as it is now – just a click and a SALE away. Everybody is cool – yet, it’s never been this hard to be creative and original. As Tyler Durden said – everything’s a copy of a copy of a copy. And, although that counts for the world itself, it’s also very accurate for the social media phenomenon I’m addressing. Basically, what I’m talking about is scrolling through an infinite deja vu of bleached, nameless and gritless shots taken just to be liked by other people who are also trying to achieve the same thing – nothing. And it doesn’t end with photography, the same goes for writing. In the midst of creating this post, my girlfriend sent me an article, some kind of Life update published on a blog with +1mill following. Couldn’t finish it, that’s how irrelevant it was. 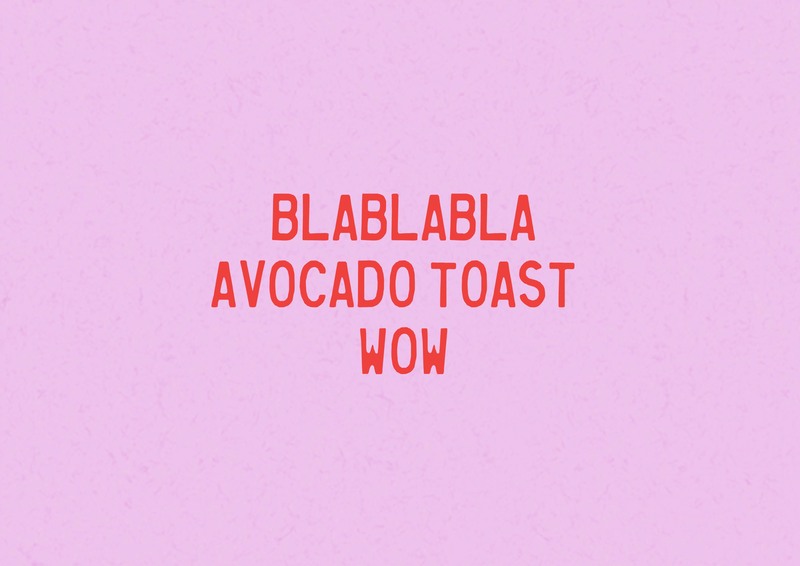 Blablabla avocado toast. Wow. Why I feel so compelled to talk about this? Glad you asked! It’s because I was one of them, and still partially am. It’s true. I probably am a piece of the basic puzzle I hate so much. There’s a lot of fish in the sea, and numbers-wise I’m most likely to be a sardine. Still, I feel like this is something we should discuss and I’m honestly very curious to hear other opinions. I love pretty flat lays and coffee shots. I also love the Eiffel tower and I think it’s great you bought that baguette to match your striped shirt while in France. What I don’t love so much is complete absence of personality, a lack of human touch. The feeling that I’ve seen this before and it was better and it was fun. Showcasing your own personality on social media can be tricky but it surely can tackle your creativity so why not give it a try? Truth is, very few people actually manage to follow trends. That’s because you have to be fast and ready and dedicated, otherwise you’re just recycling ideas and concepts thousands of people already tried before you. Do you know what next peonies are? Is it lemons?? Or pumpkin flowers?? We never know for sure. Coffee shot is a sure thing, I get it, but it’s also boring and whatever. Bottom line – It’s perfectly ok if you choose not to follow trends. Or people for that matter. It’s even daring. Recently I unfollowed bunch of folks on Instagram. I felt like it. I also noticed I feel so much better spending time there lately. I’ve never had less likes and comments on my photos than I have at this moment but I feel good about (almost) all of my content because it’s true. For some time I didn’t even think about what I’m doing. I didn’t care if I liked it, it was important to me that it met certain social media standards, and it did. It got likes. It still happens – just few days ago I posted a cup of blueberries that got 250 likes. The video I made and posted right after got about 100. We live in a word of plain blueberries, but I would still choose a thoughtful video over a generic photo and that’s my first step out of the dull puzzle we’re in. Whitening is dead – POWER TO THE FLAWS! Coffee table books – Only ok if you don’t just use them as a cappuccino coasters. Peonies and hydrangeas – Ok. Ok. I know you have to. I have to. Editing – Less white, more rich hipster pretending to be poor. Sky – Still blue the last time I checked. Eyebrows – Take it down a notch. Captions – Take me back; Guess where I’m headed next? ; Breakfast of champions; Everything else. Love your thoughts, and think the same. Keep fighting the good fight.